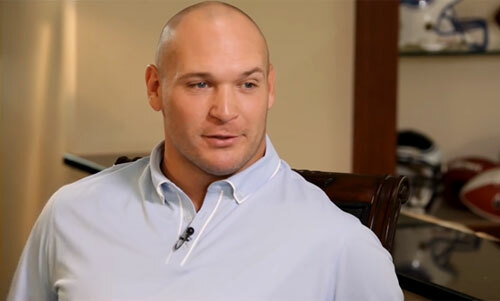 Brian Urlacher is a former NFL linebacker who played his entire 13-year career for the Chicago Bears from 2000 to 2012. Urlacher is an eight-time Pro Bowl selection for 2000 to 2003, 2005, 2006, 2010 and 2011 plus he is a four-time First-team All-Pro for 2001, 2002, 2005 and 2006 as well as a Second-team All-Pro for 2010. He was the NFL Defensive Player of the Year for 2005, the NFL Defensive Rookie of the Year for 2000 plus he was selected for the NFL 2000s All-Decade Team. Brian Urlacher played college football while attending the University of New Mexico and is the most decorated player in New Mexico history. His number 44 was retired by the New Mexico Lobos in 2013. Brian Urlacher was inducted into the College Football Hall of Fame in 2017. Sports Speakers 360 is a booking agent for pro athletes. If you would like to book Brian Urlacher for a speaking engagement, appearance or endorsement, contact a Brian Urlacher booking agent for fees at 1.855.303.5450.